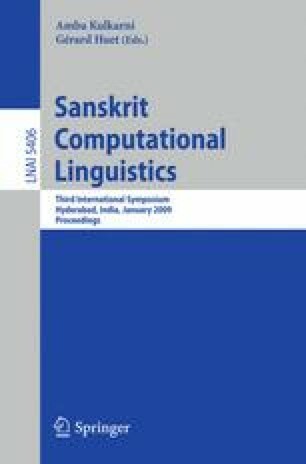 The paper describes Sanskrit Analysis System (SAS) – a complete analysis system for Sanskrit. Some modules of this system have already been developed. The system accepts full text inputs in Devanāgarī Unicode (UTF-8). The sandhi module does the segmenting for complex tokens and then hands over the text for detailed processing. Currently, the SAS modules have independent interfaces for unit testing at http://sanskrit.jnu.ac.in. The authors are working on the integration process of these modules. The SAS has two major components - the shallow parser and the k(raka analyzer. The shallow parser has separate modules, some of them are partially implemented, and some of them are in the process of being implemented. The modules have been developed as java servlet in unicode using RDMBS techniques. The applications of the SAS will be many ranging from being a Sanskrit reading assistant to machine translation system from Sanskrit to other languages.